The native habitat of the tree peony is confined to a comparatively small area in eastern Szechuan and Shensi in western China. 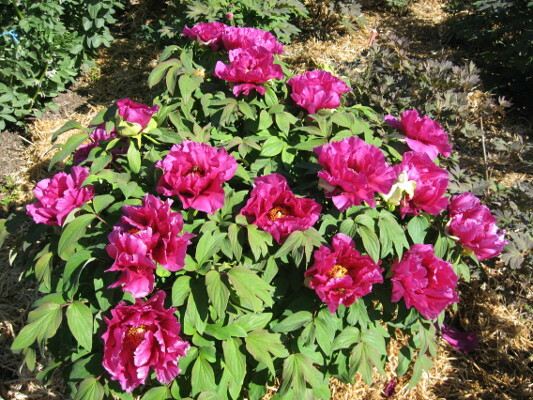 The tree peony of China was known as "The King of Flowers". Most scholars believed that they have been grown for about 1500 years in China, but the new research indicates that Chinese practised the medical use of tree peonies in the Huang Emperor Period (5000 years ago). For many centuries the rulers of China decreed that such regal flowers could be grown only in the gardens of the imperial palaces. During Tang dynasty (AD. 618-906), tree peonies were very fashionable and good ones fetched very high prices. It is recorded that the variety Bai-Liang-Jin (Hundred-Liang-Gold) was actually sold for about 3.5 Kilograms of gold. To the great artists it has always been a favourite subject whether in paintings, poetry, ceramics or jade carvings. Tree peonies are perennial shrubs with a mature height of about two metres. However, tree peonies are more like many tree in longevity. This makes them distinct themselves from most short life flowering perennials. It is well known that tree peonies can last for over 100 years. They can be handed down generation to generation if planted in the garden of a family home. In this respect, they can be planted to memorialize a special event such as the birtyday of the children. Tree peonies are not difficult to grow if you give them a generous start and wait patiently with their sparse production of blooms the first year or so. For a real flower lover, never to make the acquaintance of the tree peony is to miss one of life's most pleasing experiences. Last Updated: 17 January 2016 .